The preposition en can be summarized as "to or in," but it’s a bit more complicated than that. Il habite en Provence. He lives in Provence. Nous allons en France. We’re going to France. La réunion aura lieu en été. The meeting will take place in the summer. Je l’ai fait en cinq minutes. I did it in five minutes. Il faut le couper en deux. You need to cut it in two. 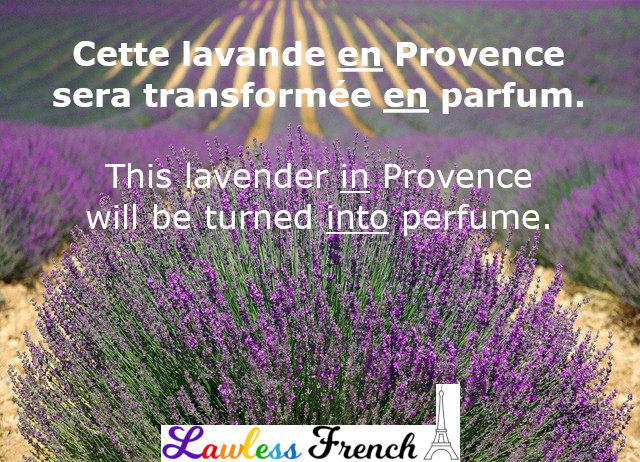 Elle sera transformée en parfum. It will be turned into perfume. Je vais à la plage en taxi. I’m going to the beach in a taxi. Il préfère voyager en train. He prefers traveling by train. J’ai vu un homme en chapeau noir. I saw a man in a black hat. Il faut être en cravate. You have to wear a tie. Il a agi en tyran. He acted like a tyrant. Je te le donne en cadeau. I’m giving it to you as a gift. Il l’a dit en pleurant. He said it while crying. En partant, elle est tombée. While leaving, she fell. Many verbs must be followed by en in front of a noun. En is usually followed directly by a noun, with no article in between. Learn more: Prepositions with nouns. Note: En is also an adverbial pronoun.